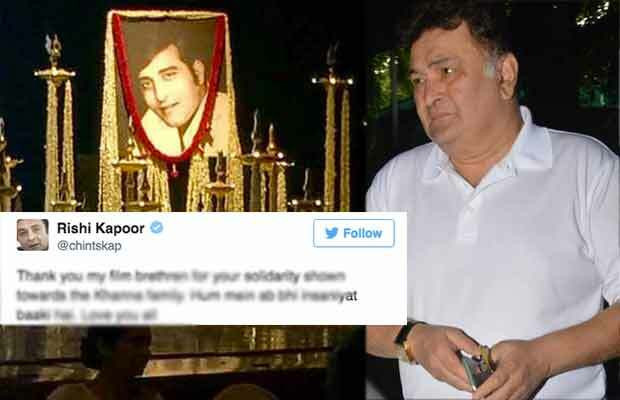 Veteran actor Rishi Kapoor, who had posted angry tweets after stars from the younger generation didn’t make it to Vinod Khanna’s funeral last week, was at peace with the attendance at the late actor-politician’s prayer meet here. Rishi thanked members of the Hindi film fraternity for showing solidarity towards the family of Vinod Khanna’s family. “Thank you my film brethren for your solidarity shown towards the Khanna family. Hum mein ab bhi insaniyat baaki hai (We still have humanity left in us). Love you all,” Rishi tweeted on Wednesday night. The prayer meeting for Vinod Khanna on Wednesday was attended by most of the actors and actresses. Farhan Akhtar along with Zoya Akhtar and Ritesh Sidhwani were the first to reach the prayer meet at Nehru Centre in Worli. Shah Rukh Khan, Aamir Khan, Kiran Rao, Amitabh Bachchan along with Abhishek Bachchan and Aishwarya Rai Bachchan, Hrithik Roshan, Kareena Kapoor Khan, Arjun Rampal and Arbaaz Khan soon followed. Veterans like Javed Akhtar, Prem Chopra, Jeetendra, Shakti Kappoor and Abbas-Mustan were seen offering prayers and condolence at the prayer meet. Khanna’s “Jurm” co-star Sangeeta Bijlani was also seen with Pooja Bhatt and Mukesh Bhatt. Vinod Khanna passed away after a long battle with bladder cancer on April 27. Previous articleYou Won’t Believe The Whopping Budget Of Kamal Haasan’s Tamil Bigg Boss House!